Ronald Barrons wrote: Behind the school was outcrop of granite that was boulder strewn as you can see. I remember it as the best play area. We would often play a war game with sides advancing from each end. I even recall when the pine cones were in season, they would become the projectiles. Lillian Moore came from Keene to teach at the Cordova Mines school and ended up married Demin Barrons, brother of Ross. Lorene MacIntosh came from Southampton to the Cordova School to teach and married Jim Barrons after boarding with his parents. 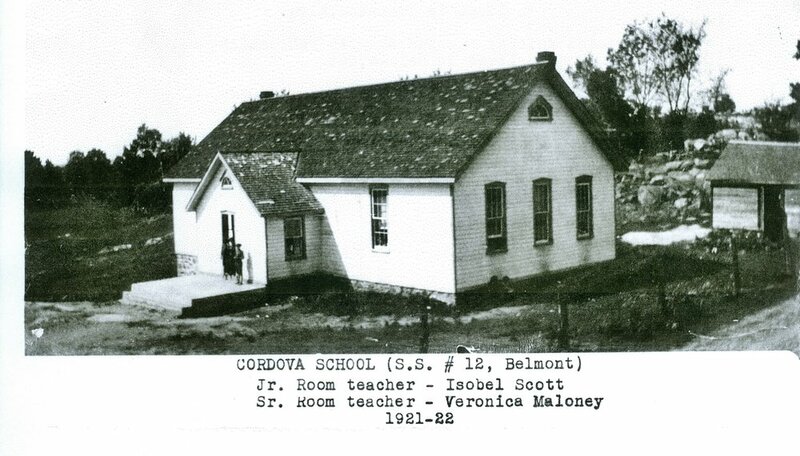 The old Cordova School, which was known as S.S. #12 Belmont* was a two room frame building with a porch on the front. My family had very close direct ties to the Cordova School. The contractor for the building of the school in 1901 was Ted Barrons, an uncle of mine. 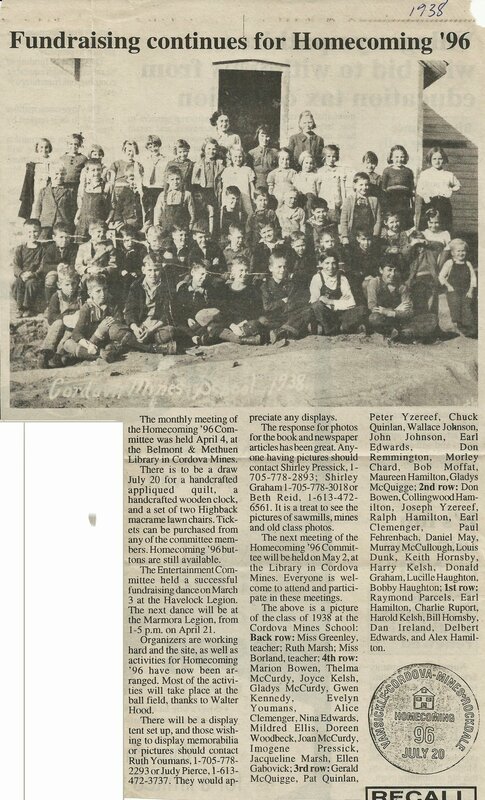 There was at least one "Barrons" in attendance from the year the school opened until the beginning of the 1967-68 school year. If the school had remained opened, there would have been about a five-year gap before the next generation of Barrons became school aged. The old wood shed out behind the school held the winter's heating fuel for the wood-burning stoves, our only source of heat. One was located in the middle of each room. I remember drying our mittens, by either laying them under the stove or over the metal heat deflector which surrounded the stove. The "big boys" had to carry in the wood and the drinking water. The johns were outside and the Eatons catalogue was handy. Lunch was usually carried in a honey pail and we had no thermos. Sometime in the 1960s, when the school was modernized, an oil furnace, flush toilets and running water were installed. The junior (little) room contained Grades 1-4, the senior (big) room 5-8. It was a real big deal when you got to go into the big room. You really thought you were someone special then. The rooms were similar in layout with the exception of the long, wooden table and small wooden chairs which the Grade 1's used. Then it was up to a desk and chair of your very own. Being in the big room meant you had more responsibility as well as more privileges. Before class was dismissed for the day, you had to turn your chair upside down on top of your desk. The caretaker (who often had willing volunteer helpers) was responsible for returning the chairs to the floor upon completion of the cleaning duties. Sometimes you were even asked to go into the little room and help the teacher there. Each person's desk was considered private domain, although the teacher sometimes mad impromptu spot checks for neatness. Usually the teachers made the students sit in alphabetical order of the first letter of their surname. I always resented that, I guess, because "B" comes so close to the front of the alphabet. Sometimes I even had to sit in the front seat if there were no "A's" that year! Looking back, I think the neat thing about the two-room school system was that you were always learning. If you had finished your assigned work, you either had a book to read, or you just sat and listed to the lessons being taught to the other grades. The teacher was responsible for teaching all subjects to all grades in that room, arithmetic, composition and grammar. There was always a reading of the Bible and prayers, and also the singing of the national anthem. The teachers were a lot stricter than they are today and they had the student's respect - even if they did not have the students' admiration. The teachers had control over the students and relied on the strap, if necessary, to bring unruly students back in line. The students quickly learned that no nonsense was tolerated. Although I said strict, they were also truly dedicated teachers who were concerned, caring and responsible people with a real desire to instill their values and lessons into the young minds placed in their care. There were fun times as well The big day then was riding a cattle truck to the Havelock fair with most schools taking part. Usually a couple of times a year, baseball games were arranged between schools, usually Rockdale, Preneveau and Cordova. If the game was to be played "away", only the team would go, unless enough parents volunteered with vehicles. I remember too the films we watched about once a month. These were circulated throughout the schools in the district. We were sure a disappointed bunch of students if, say, the projector had mechanical difficulties, or worse yet, the film broke. The large spools of film were handled very carefully - after all they contained precious materials. The films were always shown in the big room. On the afternoon that the films were to be shown, the students from the junior room would carry their wooden chairs and sit between the rows of desks. The blinds were drawn on the windows and the show was on. The annual Christmas Concert was the highlight of the year. Each year, a wooden stage was constructed in the junior room and many hours were spent learning lines, skits and songs for the concert. The teachers were responsible for the rehearsals as well as teaching their usual subjects. On concert night, all the parents and grandparents would come to see the show. Everyone was all dressed up in their Sunday best. Every student was expected to participate in at least one event. At the end of the concert, Santa would appear and distribute the gifts that had somehow appeared mysteriously under the Christmas tree. It was a very exciting time, but I always hated being in front of a crowd or even in a crowd for that matter. After sitting inside a warm, small sized room packed with warm bodies, the ride home in a cold car, or a sleigh with a horse team and no heater, was pure torture. In the mid 1960s, school busing commenced. Prior to that time, the Peterborough County Board of Education did not offer any form of transportation. It was the parents responsibility to ensure that their children went to school and how they ot there was, basically, up to them. The usual mode of transportation was "shanks pony" - walking. During the winter months one had to suffer through not only the extreme cold temperatures, bone-chilling winds and blowing snow, but often poorly plowed roads for travel as well. Spring led into the mosquito/blackfly plaques, especially in the low-lying areas. We lived approximately two miles north of the school and we often had to walk both ways. Sometimes, however, in extreme weather, a ride home was provided, with an amazing number of students piling into one car. I recall fondly Mr. Carmen McMillan, who for many years delivered the mail from Havelock. He was usually near the school at the end of the school day and would give us a ride home. He knew all of us b name and dropped us off at home, stopping whether there was mail to be delivered or picked up at the home, r not. I am sure Canada Post would definitely not allow that today. I became acquainted with his daughter, Faye, over the course of the summers when she accompanied him on the mail route. We became friends when we both started high school and were riding the same school bus, and have remained very close friends ever since. Mr. McMillan's wife, Marion, was also a school teacher at Preneveau and at Havelock until she retired. S.S. 12, the Cordova school, officially closed its doors in June 1969 (?) Students were bussed to nearby Havelock or Marmora to attend public school. Secondary students continued to attend Norwood District High School, Marmora Secondary School or even Centre Hastings Secondary School in Madoc. George Wiggins, Harold Ellis, David Saunders, Russell Wiggins, unknown, John. Chard, Don Pressick, Keith Wiggins, Gerard Fehrenbach, (m, Ito r) Jack Pressick, Keith Hamilton, Joan Anderson. Gena Kennedy, Ruth Hicks, Huda McCurdy, Lois Hicks, Priscilla Pressick, Don MacFarlane, Orville Edwards, (f, Ito r)Anne Saunders, Joanne Barrons, Wahnetia Edwards, Marilyn Pierce, Ruth Cole, Arlene Campion, Shirely McQuigge, Dorothy Ellis, Ronnie Pierce, Don Ellis, and George McQuigge. : Wayne VanVolkenburg wrote: above, Near the middle back row? with light coloured buttons and suspenders would be John VanVolkenburg. Ronald Barrons added: One of sad factor related to this particular school house came with graduating into high school. Located as it was, it was attended by students who came from both Belmont and Marmora Townships. Depending where you lived, high school years were either in Marmora or Norwood, so that friendships often became decidedly less involved. My father owned land in both townships, so my sister had a choice and chose Marmora because of friendships established who were going that direction.